The article is second in the series from Wande special issue on Kashmiri women titled Me and Militarization. Since the time I was born, Kashmir has been a place where political instability, confusion and war have claimed not only the lives of people but wreaked havoc on their emotional and psychological lives. I was born to witness the world which was patrolled and visibly controlled by security forces who were the cause of fear and dejection found in Kashmiri people. I was born in this beautiful valley in October 1993, when insurgency had already begun and existed for four years. It was the same day when the Bijbehara massacre took place in which fifty-one civilians were gunned down by the security forces. My birth was not a usual one; it brought joy and sorrow simultaneously. This very month saw two major incidents - the Bijbehara massacre and the Hazratbal Dargah siege. The siege of the Hazratbal Dargah lasted a month and ended when militants who laid the siege, were given a safe passage. The early years of my childhood were gripped by insurgency and the incidents attached to the militancy and counterinsurgency were in full flow. During the period of my childhood, I was well versed with the vocabulary including the grim military words like, ‘crackdown’, ‘torture’, ‘arrest’ and ‘encounter’, which would define all the situation I lived in. A regular feature in my life were gunshots and crackdowns, quite often leading my innocent mind to believe that it perhaps was an intrinsic part of all life. The constant patrolling of Indian armed forces and militants who I remember were categorized as HM, Lashkar etc., was an everyday experience I faced. While living in a village which had been politically sensitive and a centre of encounters, I would sometimes feel that I shouldn’t be living in a world which to me seemed highly fearful and challenging. For a child like me who could have been happy with playing hopscotch and moving about freely, it was always painful to witness and suffer at the same time. I still shudder when I remember how the sudden sound gunfire just a few yards away from my house broke the silence of the night and left us in a state of extreme fear. The following day a crackdown and search operation which ensued in our neighbourhood is equally hard to forget as it has left deep permanent imprints on my mind. I remember vividly the days in my native village which is situated in the southern district of Anantnag, surrounded by thick green forests on three sides which was a hotbed of militancy as it was a transit route from one area to another, particularly in south Kashmir. The topography and location of my village were such that both militants and Indian armed forces were on a prowl to keep a close watch on the movements of each other. The nocturnal raids, crackdowns, search operations, exchange of fire associated with the insurgency or counterinsurgency were common. Especially the nocturnal raids, as I remember when I go down the memory lane, were so frightening and chilling that our household as like other households in our locality would in case of any untoward situation. The crackdown or cordon and search operations to locate and eliminate militants was horrific as it was accompanied by a heavy exchange of fire and arson. These crackdowns have been part of our lives and continue to this date, although the frequency has decreased in some areas. Every night I wished for a sound sleep but was unable to get one. The horror we experienced every night was something I cannot put into words. Whenever there was a knock at the door, especially during the night, we used to tremble with fear. Those midnight knocks would frighten and always leave my innocent mind disturbed. As time passed government agencies devised a counterinsurgency plan. In this plan, a group of surrendered militants were lured to join the ranks of government to fight against the militants and were popularly christened as Ikhwans/Nabidis. The period of Ikhwan was the most gruesome and horrifying, in my experience. The civilian killings which were already common became more frequent and the order of the day. 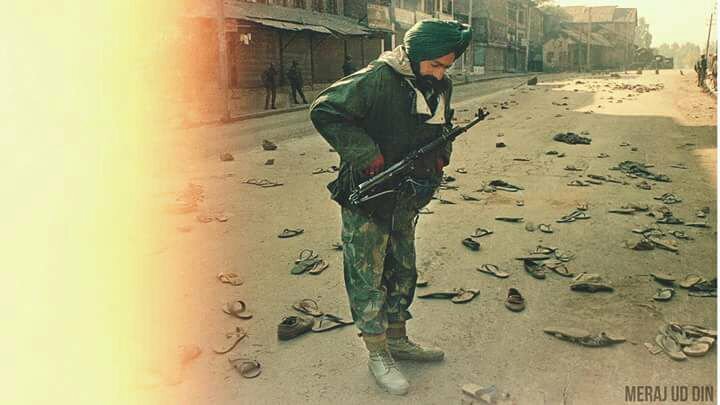 This was the time when it was difficult for a commoner to differentiate a Militant and an Ikhwani, like looks, style, attire and language was similar and both brandished a beard and an AK 47 gun. I cannot forget that heated argument which took place between my elder sister and an Ikhwani who claimed to be a militant, tried to get into my house. My sister protested and restrained him from doing so; it left him so furious that they were about to shoot at her. Fortunately, she escaped death and the Ikhwan never came back. The next day I along with my sister went to the market and saw the same person with the Indian armed forces. I lauded my sister for not letting him into our house. I was proud of how brave she had been. By the time I joined my primary school this counterinsurgency was in full bloom. Phrases like loot, arson, kidnapping, murder, ransom had already taken the position in our lexicon. As the time progressed I became witness to an incident when our local school, where I was studying, became a battlefield in which many students of my school received bullet injuries and one succumbed to her injuries. The school was taken into siege almost for a day leaving us all in a state of extreme fear and panic. This was the most painful experience I ever had. That hue and cry by students and teachers when one of my senior school-mate died on spot are equally hard to forget. In 2014, when the Peshawar massacre took place in which a hundred odd students were killed, for me was a reminder of the incident and the trauma I had gone through in my childhood. Whenever I choose to cherish my not so sweet childhood, the fangs of this most unwanted serpent bite me and in my unconscious mind, I keep thinking about those untoward happenings which took place. The insurgency and the counterinsurgency has left everyone in a state of confusion as no one seems to know the way out. Today, as an adult and a student at a university, I often go down my memory lane and my memories teach me a lesson. The fear psychosis I experienced throughout my childhood and teenage still takes a heavy toll on me. I often meet persons who have been the victims of torture on both sides of the fence. With time, I have begun to understand and recognize the background of this conflict and I often mumble to myself these lines from the Hamlet that “something is rotten in the state of Denmark (Kashmir)”. I grew up to develop an interest in the politics of Kashmir and its historical narratives. I grew as a person whose psychological, emotional and spiritual life has got automatically attached to a political question which has been devouring precious lives of human beings across the border. Having lived in a state which has been politically disturbed and violent at many times, it is expected natural that people, elders and youngsters, alike are eager to see Kashmir transformed into a place where everything is peaceful, favourable and supportive to life. I have always been occupied with thoughts about the future of Kashmir and its people. I have strived hard to keep my hope up for better and joyful times ahead. Now as a grown-up girl, whose childhood was marred with fear and trepidation, I have come to understand the politics of Kashmir. But I failed to locate my political orientation till now given the complexity and confusing political situation Kashmir seems to be in. I sometimes feel at the side of some camp but at the next moment, I find myself having tendency favourable to the opposite camp. This confusion is what I see lingering deep down in the general political psyche of all Kashmiri people and organizations working for the resolution of Kashmir. The author is pursuing a PhD in Mass Communication and Journalism at Lovely Professional University.